I had been cycling around the hills north of Framlingham. It was January 2009, the coldest month in years. In the early afternoon, a man in a garden near here told me that the temperature was minus three, but it felt much colder. My heart had been warmed by the beautiful and welcoming medieval parish church at Bruisyard, across the hills, but Cransford parish church appeared to have been abandoned. The church was locked, the only locked parish church for miles, and there was no keyholder notice, no notices at all, no sign of life. Heading out of the village in the direction of Great Glemham, however, I passed this fine modern building, with obvious signs of a busy life, and I knew that Cransford did have a spiritual heart after all. It is on the site of the original Cransford Baptist Chapel, which had been erected in 1841. The community moved here from Hacheston. John Baldwin, the Minister, lived at Bruisyard, and claimed an average attendance of 150 at the time of the 1851 Census of Religious Worship. This seems a lot from a parish of barely 300 people, but presumably Baptists came here from Bruisyard as well. George Pooley, the Rector of the local Anglican parish church, claimed between 50 and 100 attenders there, but he was also Perpetual Curate of Bruisyard, and alternated his morning services between the two parish churches. Probably, there were those who attended both churches, and more who attended the church in the morning and the chapel in the afternoon, but it is usual to find Baptist chapels with larger attendances than the local Anglican parish church in the middle years of the 19th Century in Suffolk. Cransford Baptist Chapel was one of several Suffolk non-conformist churches destroyed by the Great Storm of 1987. As in most cases, the replacement building was a great improvement in terms of facilities and suitability for modern worship - it is an ill wind indeed which blows nobody any good. 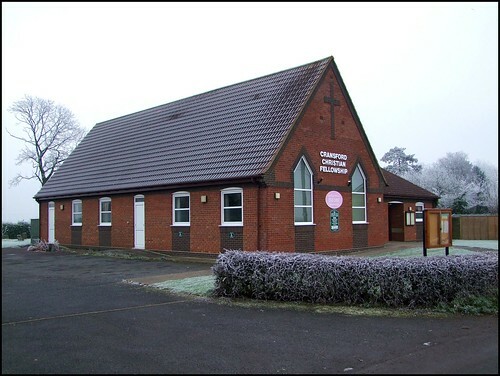 The new building is now rebadged as Cransford Christian Fellowship, the name and large car park reflecting the fact that the Baptist tradition is one of gathered communities. Loads seems to be going on here, judging by the notice board and the church website. But there is local traditon here as well, because the new building retains the old graveyard, which is beautifully maintained behind the new church. A sign on the grass asks children Please do not play on the graves - whether out of respect or in fear of litigation, I couldn't say. But I liked the sense of a community mindful of its past, and purposeful in the present.